Best/Worst Movie Trailers of the Week, Hercules, The Boxtrolls, Gimme Shelter, Enemies CloserIf you’re still feeling the effects of your Thanksgiving food coma, you’re in luck! It’s time to sit back, relax, indulge in the top trailers that hit this holiday week and get a quick laugh at the expense of those that didn’t make the cut. Island of Lemurs: Madagascar earned some major cute points courtesy of its adorable, high-flying stars, but three other promos offered up a little bit more to be thankful for. 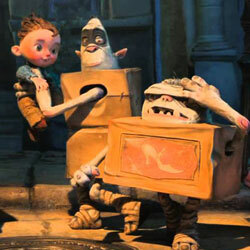 Perhaps someone should make a movie about stop-motion animation artists because the latest trailer for The Boxtrolls is downright mesmerizing. Rather than focus on the finished product, this new promo offers a look behind the scenes, showing off the astounding amount of time, precision and heart that goes into each and every frame of the film so by the time the piece does show off completed footage, the added insight will make you appreciate it tenfold. Despite striking visuals and Josh Brolin’s all-in performance, the new “Oldboy” fails to build a riveting, believable mystery strong enough to support its big twist. In the Spike Lee film, Brolin stars as Joe Doucett, a deplorable advertising executive who has all the time in the world to drown himself in alcohol, but none to spend with his daughter. During one particularly drunken night, Joe is snatched off the street and wakes up trapped in a small room. After 20 years of solitary confinement and dumplings, Joe is suddenly released and challenged to figure out who ordered his lengthy prison sentence and why. If you’ve seen the Chan-wook Park original, it’s impossible to experience this new version objectively, but Lee’s rendition does deserve a standalone assessment first. 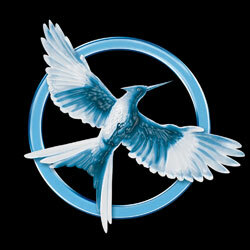 Francis Lawrence did it. He stepped in for Gary Ross and didn’t just churn out another quality Hunger Gamesadaptation — he raised the bar even higher. But now that begs the question: can he do it again? The odds were in Lawrence’s favor in every respect withCatching Fire. He had a built-in audience, a much bigger budget, all the star power in the world and, most importantly, impeccable source material. After reading the trilogy countless times over, Catching Fire is still the most fluid of the bunch and is absolutely brimming with cinematic quality. Even though Hunger Games is a close second toCatching Fire, from a book-to-film adaptation standpoint, the fact that Catching Fire was able to nix the world-building and hit the ground running gave it the edge, and writers Simon Beaufoy and Michael Arndt certainly used that to their advantage. 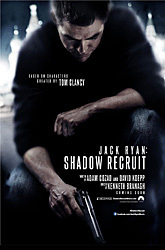 A new iteration of the Tom Clancy character, Jack Ryan, is about to hit the big screen and to ring in Jack Ryan: Shadow Recruit‘s impending January 17, 2014 release, Jack Ryan himself, Chris Pine, and Paramount screened 17 minutes of footage from the film in New York City. In the Kenneth Branagh-directed film, we follow a young Jack Ryan as he tries to thwart a financial terrorist plot in present day Moscow. 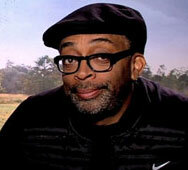 Before rolling into the footage, Pine prefaced, “Jack, he’s an analyst. He is a man that is physical, but is much more comfortable being behind the scenes.” Unlike a James Bond or Jason Bourne-type character who can quickly and naturally spring into action, simply put, Jack is scared. Pine further explained, “It’s a scary thing, just like if any of us were confronted with a violent or physical situation. You see a man who actually shakes.” And Pine meant that literally because in the footage screened, Jack trembles quite a bit. Who knows what we would have got had Will Smith and Steven Spielberg followed through with their plans to remake Chan-wook Park’s Oldboy, but, odds are, it would have been entirely different than the one we’re getting from Josh Brolin and Spike Lee on Wednesday, November 27th. Brolin stars as Joe Doucett, an advertising executive decimating his career and family life with his abysmal behavior and alcohol addiction. At the tail end of one particularly drunken night, Joe is snatched off the street and wakes up in solitary confinement. After 20 years of loneliness and dumplings, he’s suddenly released and challenged to figure out why he served such a lengthy sentence. Better prepare yourself for many days’ worth of running around singing, “Let it go, let it go,” because there’s no way you’re walking out of “Frozen” without a pep in your step, massive smile on your face and the desire to build a snowman. “Frozen” features the voices of Kristen Bell and Idina Menzel as Anna and Elsa, the princess of Arendelle. As kids, Anna and Elsa are inseparable. But, when Elsa realizes that she’s got the ability to create snow and ice, she also realizes that her newfound powers put her loved ones at risk. In an effort to keep Anna safe, Elsa takes off into the mountains, but buries a summertime Arendelle in a winter’s worth of elements along the way. Now, with the help of a mountain man named Kristoff (Jonathan Groff), his lovable and loyal reindeer Sven, and Olaf (Josh Gad), a snowman with a thing for summer, Anna must trek up the mountain and convince her sister to thaw their home. Writer-directors Chris Buck and Jennifer Lee cracked “The Snow Queen.” Disney’s been trying to develop a big screen version of the Hans Christian Andersen story for quite some time and while “Frozen” is far from a straightforward adaptation of that work, the deviations are brilliant and turn the final feature into a piece that’s got a classical appeal, but also wholly relatable modern twists. Elizabeth Olsen has maintained a steady stream of work since her indie hit, Martha Marcy May Marlene, but with films like Godzilla and The Avengers: Age of Ultron on the way, Olsen is going to hit a whole new level and she’s about to begin that progression up with the highly anticipated remake of Oldboy. Olsen steps in as Marie Sebastian, a volunteer nurse who comes face to face with Josh Brolin’s Joe Doucett shortly after wrapping up his 20-year stint in solitary confinement. Even though Joe is understandably rattled and rather off-putting, he strikes a cord with Marie and she agrees to help him assimilate. The thing is, in order to do that, she’ll have to dive into the vicious mystery that’s been plaguing him for the past 20 years of his life.